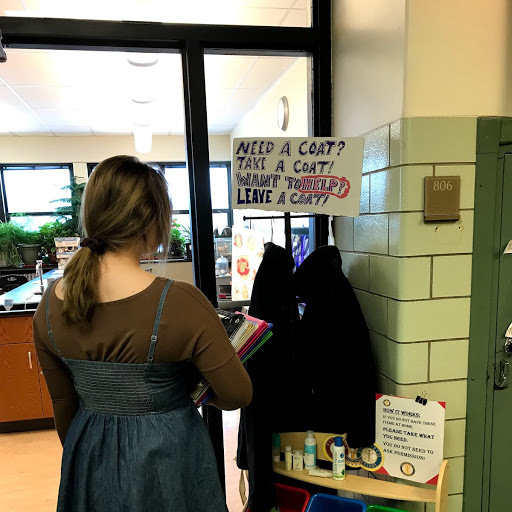 Students participate in the coat drive. Imagine it’s Christmas morning and you come down the stairs to see all the presents under the tree. You can smell the breakfast your parents are making in the kitchen, and you are filled with joy. Not everyone is fortunate enough to get these things. There are many people, even in your own home town, who will wake up on Christmas morning to no tree, no presents and no special breakfast with family. You can make a difference, though. There are several ways to make the holidays special for those that aren’t as fortunate. Rotary leader John Atchley said, “The Rotary Interact Club will be accepting new books, toys, etc. to donate to one family in Ottawa so that they, too, can have a good holiday and know that their community cares about them.” They will accepting donations until the second day of finals. Rotary will also be doing a coat drive to give to those who need winter coats. If you have a coat at home that you do not use, bring it in so that it can be put to use. Donations for this will be taken all winter. Sophomore Edie Smelko said that she donates food to the local food pantry around Christmas to help others. “I feel really good about doing this because in my life I have so much and others do not,” she said. She said that by donating, she is feeding families and also letting them know that someone cares about them. the church also does random acts of kindness. She says that mass texts go out about when and where to meet. These people then crowd around the person in need of a little extra help and hand them any extra money that they can to make a difference. “It’s really heartwarming to be a part of this. No matter who you are, you’re loved by everyone,” Smith said. She said it gives that individual or family a feeling in their heart and mind that someone always has their back. Another way to get into the giving spirit would be to participate in Red Stocking. This fundraiser helps to get gifts to less fortunate children in the area ages 12 and under. In previous years more than 2,300 children in almost 900 families were gifted. You can give names of children in need as well as donate money. Money will go towards gifts such as games, books, toys, and some food items. Red Stocking relies on community donation of time and money, so go sign up or donate if you can. There are so many ways that you can make a difference in someone’s life and help them to have a good holiday. Get out there and find a way to give to others this holiday season.